The days have been busy and the nights have been short here in PODland. Yesterday all the cucumbers made it onto the the deck — in the nick of time, really. More on that later, I’m sure. 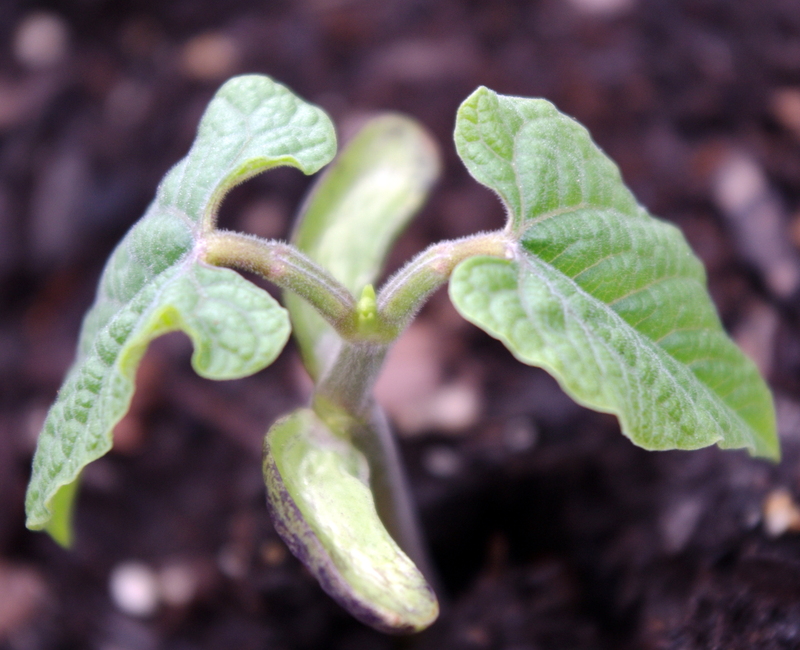 Winter Wonder (heirloom), organic soil, self-watering container. Melon French Orange Hybrid. How lame is that? Someone, please, come up with a good one for this year’s melon.Whatcha’ got? 75 days from now we should be seeing some fruit off these tough, disease-resistant vines. A conundrum: cucurbits dislike having their roots disturbed during the transplanting process, but the fruits need a while to mature. Which makes direct-seeding the way to go root-wise but that’s less optimal ripening-wise. What’s a gardener to do? Well, these were seeded a few weeks ago in peat pots and the bottoms of the pots were carefully removed just prior to transplanting on Wednesday, allowing the roots to roam freely and unmolested. Anyhoo, soil temperatures have finally reached a safe sowing range and, well, big changes are ’round the bend. The spindly suckers on deck. You’ll note that there’s plenty of room to add soil once/if the plants establish themselves. Sort of an attempt to retroactively plant the seedlings below the soil line. That, my friends is experiment #1. Experiment #2 is a little well, nerdier. If you can believe it. 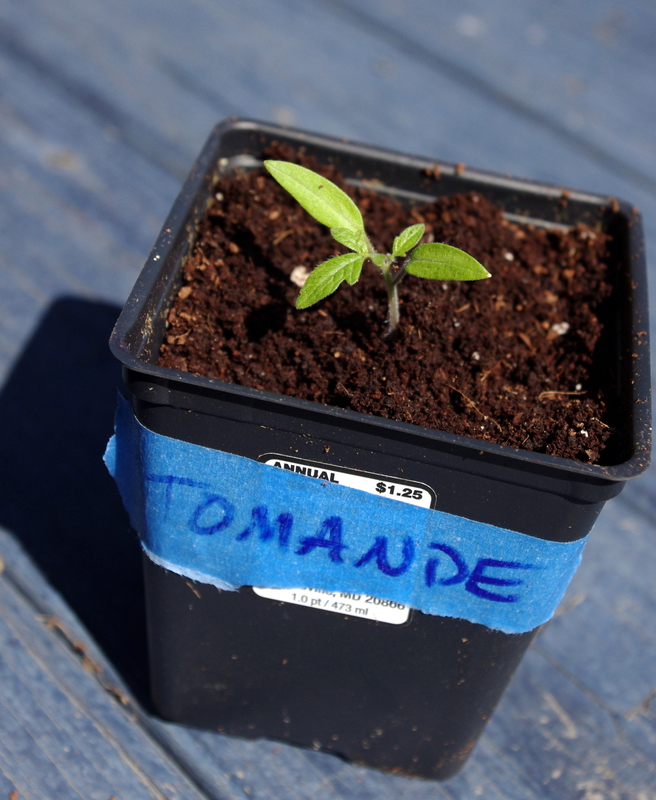 This year’s tomato crop includes tomande, gold nugget, princess of the patio and sweetheart of the patio. 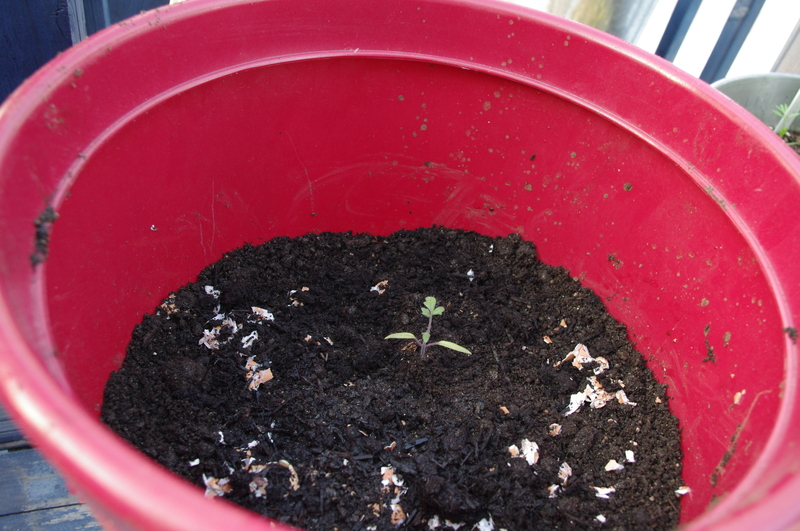 Some have been planted in organic soil and compost and some planted in evil MiracleGro. 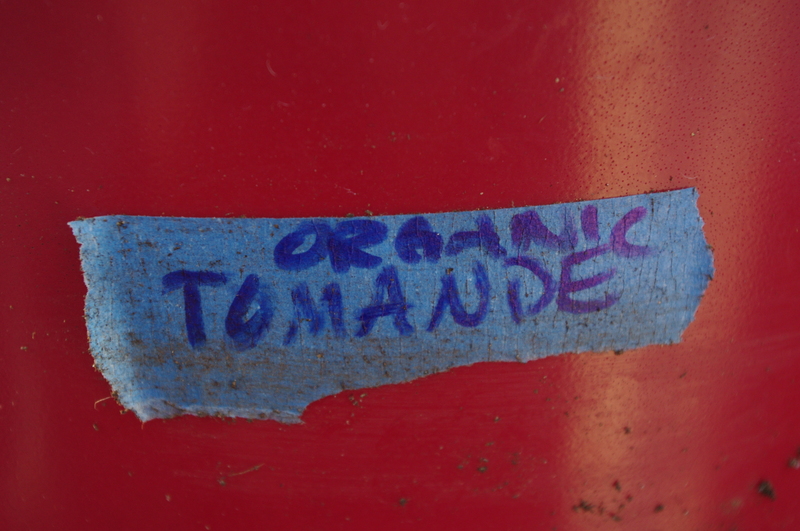 These here tomandes, however, will serve as the purest experimental control: one organic, one not. One will be treated with organic fertilizers and pest control — the other, will not. Not that there’s much on deck just yet, but the bounty out front is nicely rewarding. 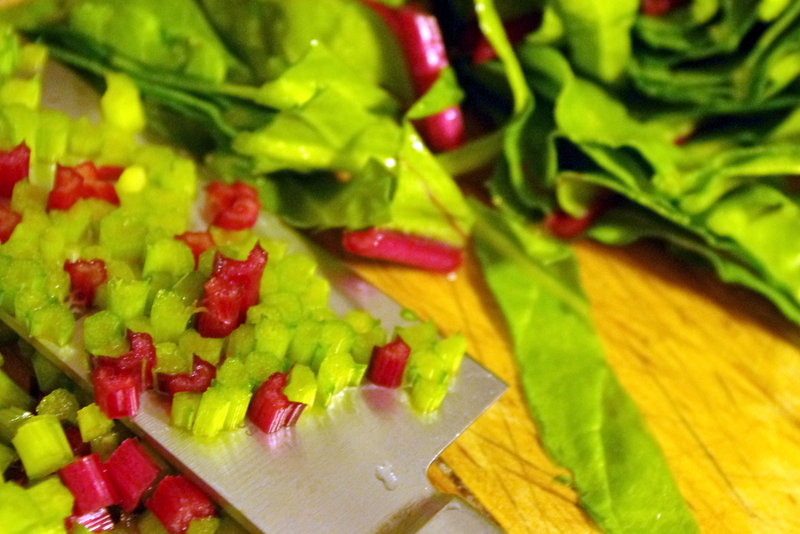 The unusually cool spring meant a bumper crop of Swiss chard in containers usually reserved for flowery-type things. Happily, all this chard makes for quick, cheap, and easy [well, easy for me — the chief cook now insists on making his own pasta — not that it isn’t absolutely out-of-sight delicious] vegetarian dinner. Simply saute the chard (diced and sliced into thin ribbons, as above) in a little olive oil with a couple cloves of thinly sliced garlic. Let it get good and wilty. The stalks should crunch a little, but not taste completely raw. This takes just a touch longer than sauteing spinach. Then toss in a little lemon zest. Serve over the pasta of your choice. No, you can’t have the hubby’s pasta. Sprinkle with a hard cheese of your choice and pepper to taste. A mere 10 days ago, Provider Snap beans were planted. Happily, one of the two has already emerged. 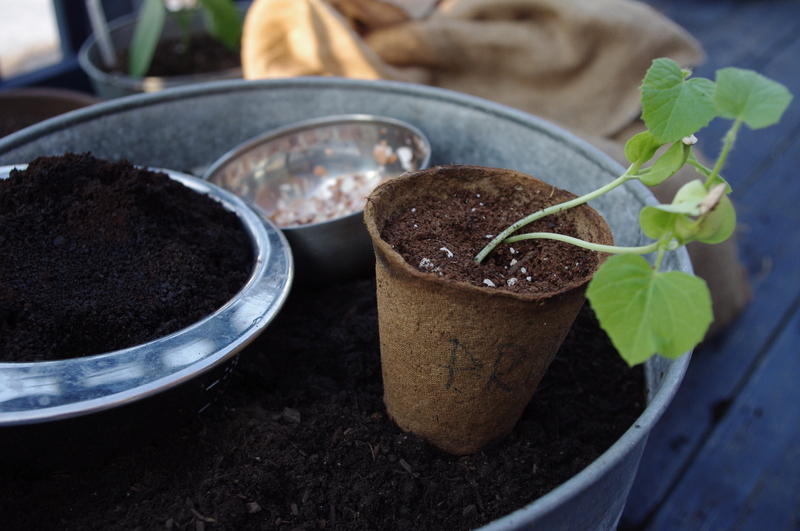 And in two to three weeks, a couple more pots will be sown — in the hopes of a nice, steady, bountiful stream of green beans. Remember March? Just about two months ago to the day, this lovely Maestro was planted. 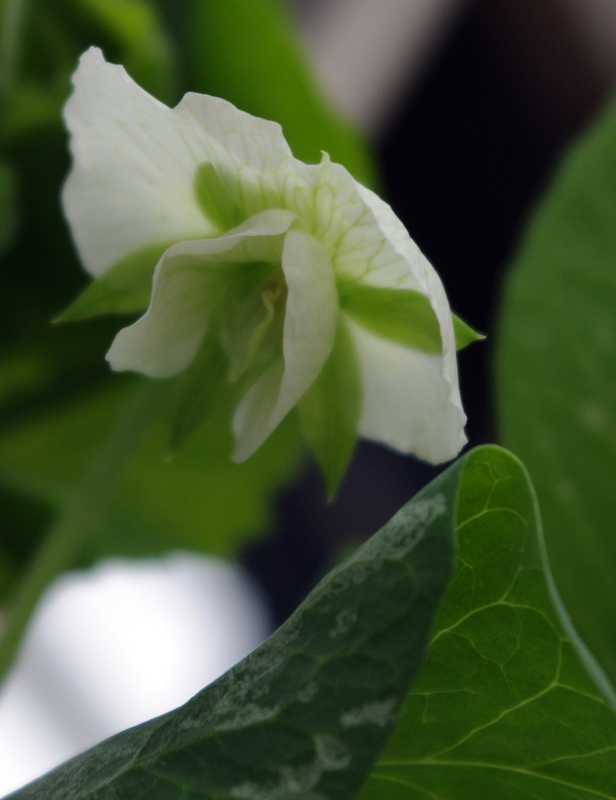 If the cool temps persist, it may be pea season pretty soon. Sort of. Inspired by BH’s garden progress, the Greensgrow-grown basil made its way onto the deck. It’s a start. Last month’s radishes are all making their way into tonight’s salad and one last planting has been seeded — because in a month or so, the little blue window boxes need to sprout sage and some bright flowery things. And on deck, the first rotation of Provider Snap bush beans have been planted. 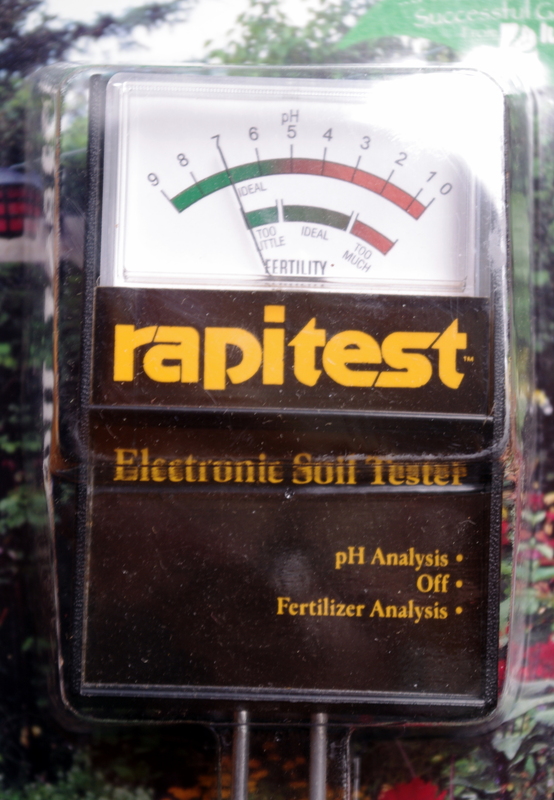 The soil pH is a tiny bit low, but the Rapid Test tell us that the fertilizer levels are just dandy. (And out of curiosity, the pots filled with last year’s soil were tapped out. Completely. Barren. No good. No surprise.) Anyway, around June 1, another two containers of Providers will join these guys — encouraging, one hopes, a pretty steady stream of tasty green beans. But, regardless of whatever silly name gardeners have given the process, it seems to make good sense. 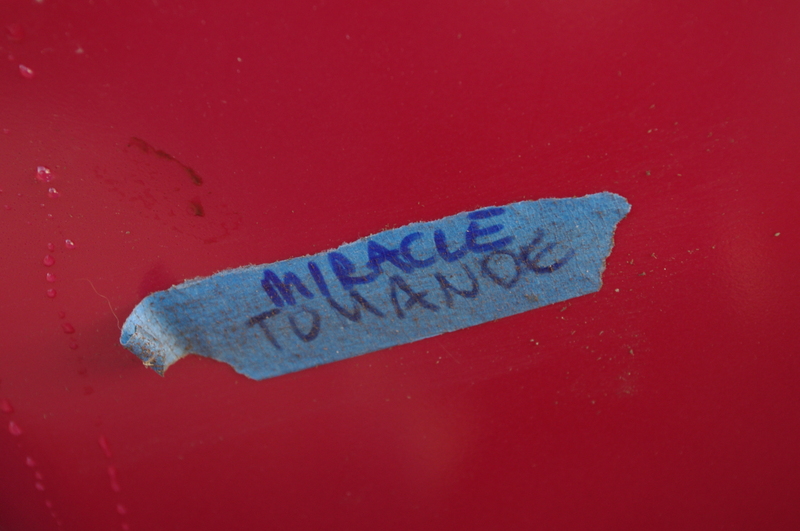 About a month ago, Tomande, Princess of the Patio, Sweetheart of the Patio, and Gold Nugget were planted. And since then they’ve glowed the night way in front of wide-spectrum fluorescent bulbs and on sunny days, soak up the rays on a warm, south-facing South Philly window sill. Last week, though, they hit a wall. The first set of true leaves had appeared — those jagged leaves that sprout just above the “baby” (cotyledon) leaves — and the leaves are a bright, happy green (indicating they’re receiving enough light), but the old nemesis, “legginess” had also joined in on the party. So, overcoming inertia and general gardening laziness, the poor little things made a trip the the little blue deck for some early transplanting. 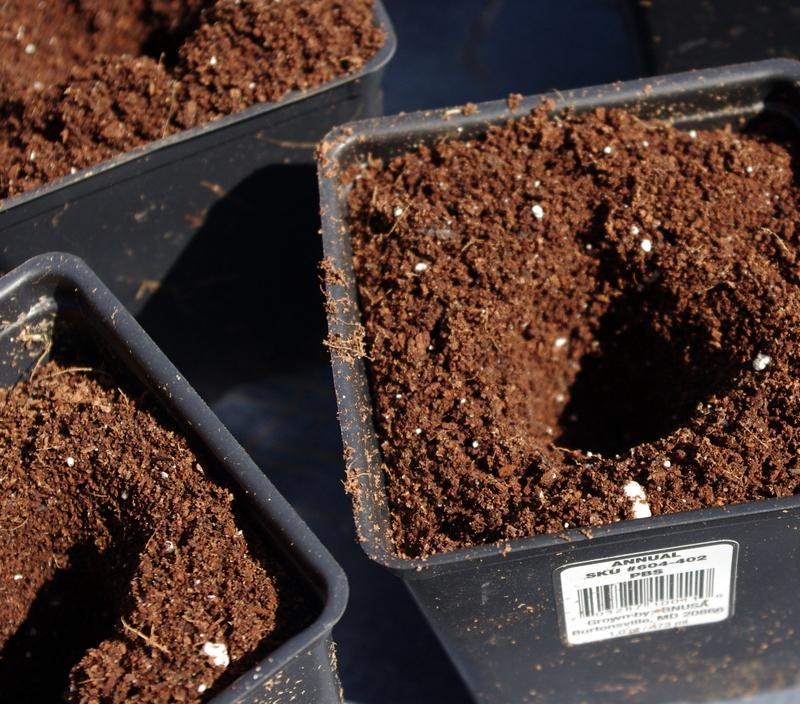 First fill new, larger pots with seedling soil, making a deep well for the plant in the center of each container. 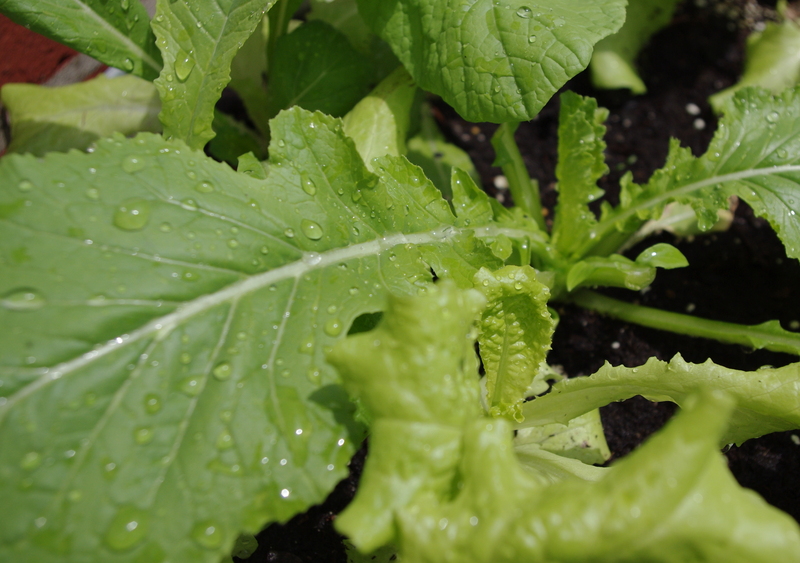 Using a fork, gently loosen the dirt around the seedlings. 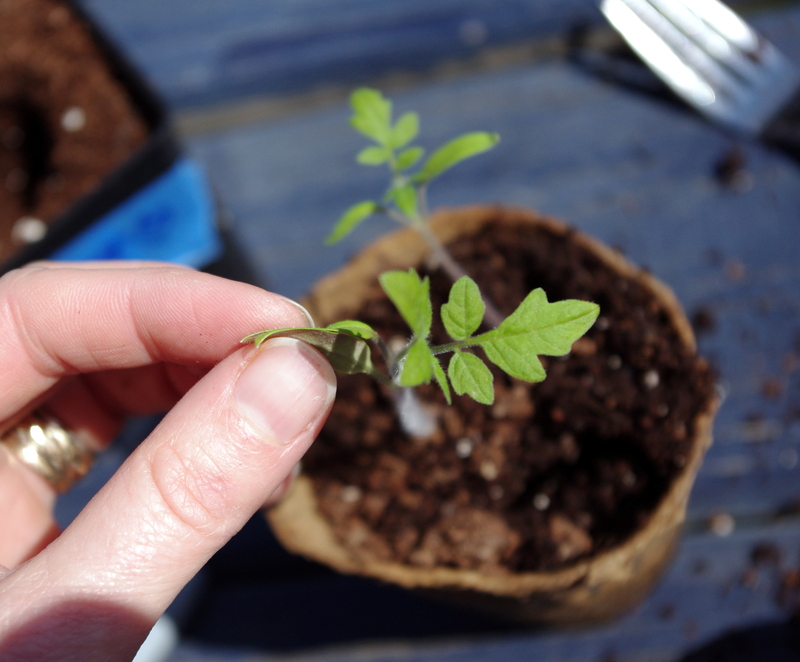 Then, very gently grasp the seedling by its baby leaves and prick it from the soil. (Hey, maybe that’s the reason. 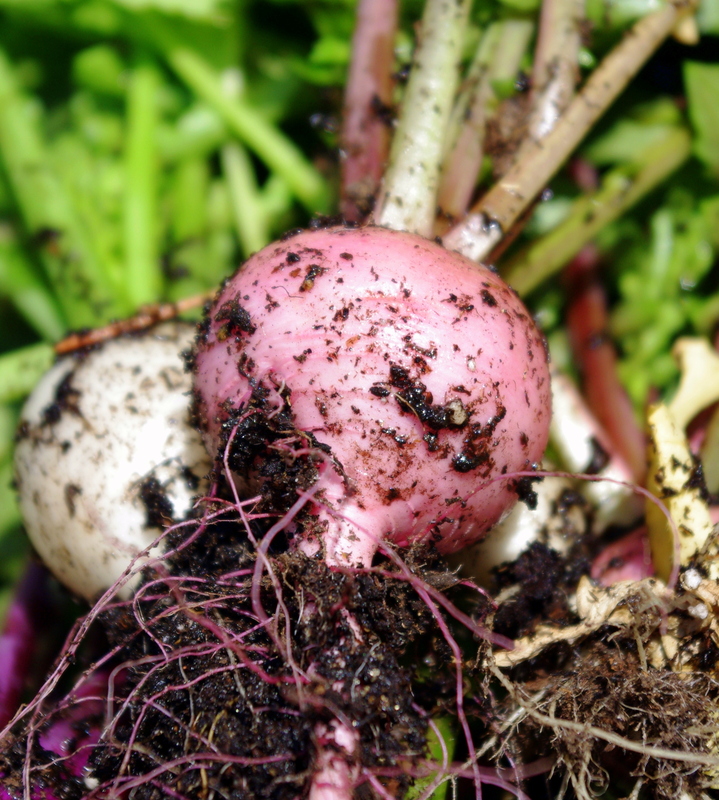 Why it’s not “pulling,” “uprooting,” or “early transplanting” remains a mystery.) 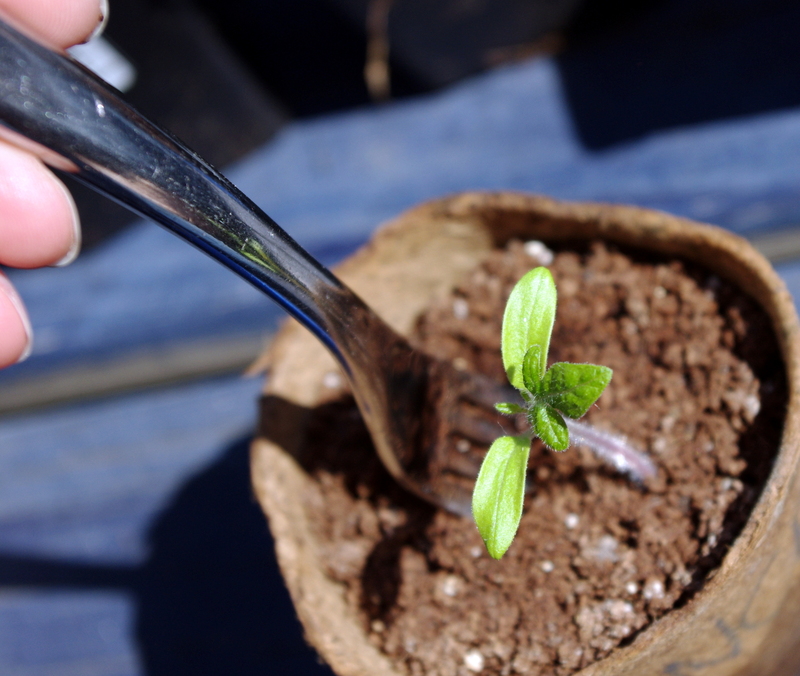 Gently lower the seedling into the hole. 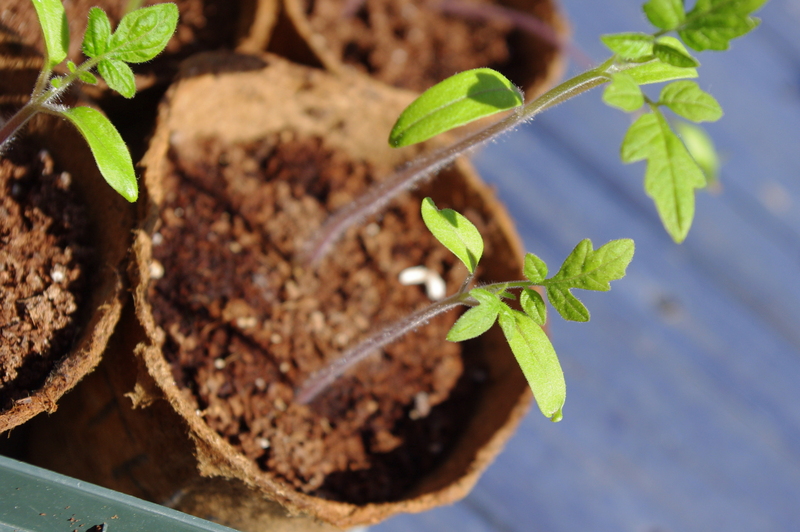 The leggy stem should be well-submerged into the new container — new roots will sprout along the newly-buried stem. Return them to their indoor location. Water and resume light therapy. Besides, it’s time for a reseeding update as the fruits of the earliest labors are already being harvested! 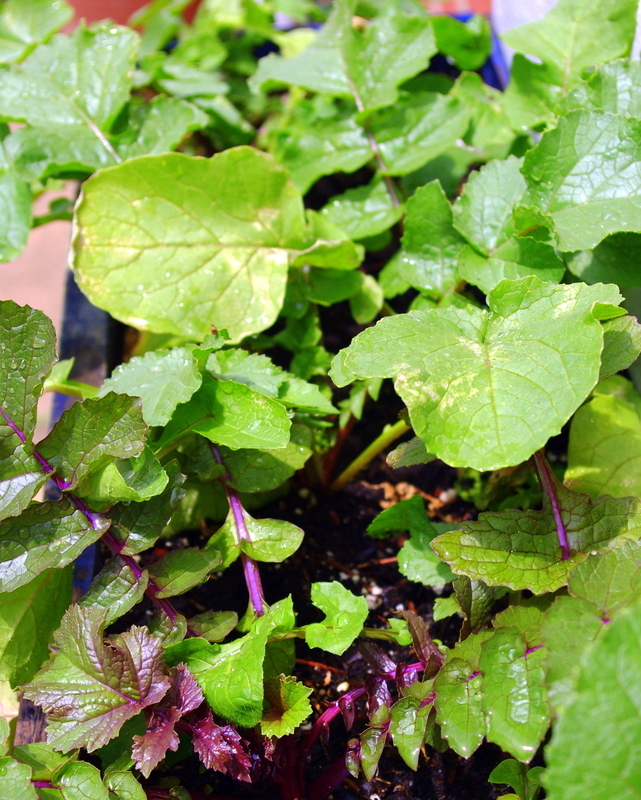 Last night’s dinner featured a salad composed entirely of Ashley lettuce, arugula, winter cress, and a variety of random radishes saved from last year’s supply (all planted around March 13). And a couple weeks earlier, the wonderful husband made his last-meal roast chicken and mashed potatoes with healthy doses of POD-grown thyme, rosemary, and chives. (This umami-tastic miracle meal is surely what this eater would choose should she have only one meal left on this earth. Preferably with a healthy side of More Vetri than Chang Brussels Sprouts. Hence, the “last meal” business). While the peas aren’t sprouting nearly as quickly as hoped for, they’re not getting yanked. So, committing long-term to them, Scarlet Nantes carrots have joined the Maestro on deck to maximize the container’s use and the Prussian Blues can do what they do out front. 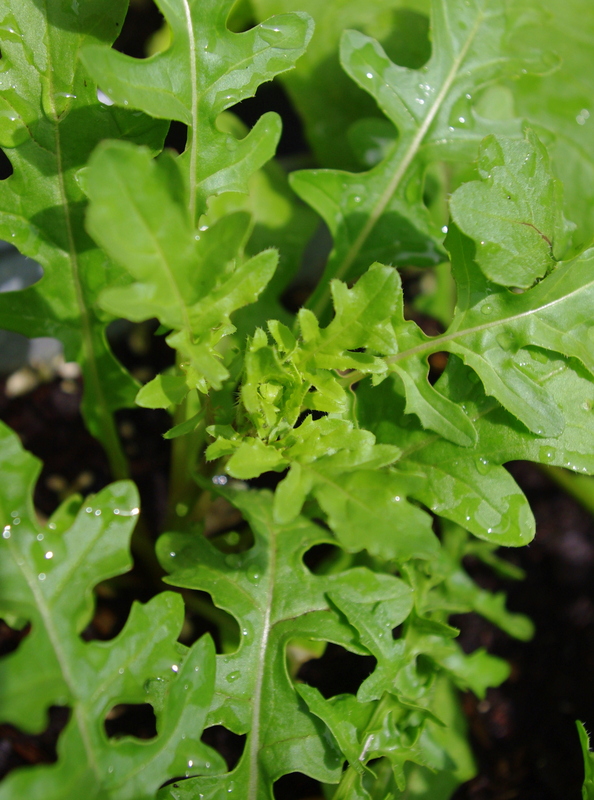 Strangely, for the second year running, the Baker Creek pepper cress failed to emerge (thankfully, the Bartram’s Winter Cress is doing just fine) so that widow box has been reseeded with a second round of radishes and tennis ball lettuce. And, finally, a brave tarragon that spent most of the winter hibernating in an office window sill, joined the chives, thyme, and oregano in the well-used herb planter recently relocated from the little blue deck, to the plants out front. 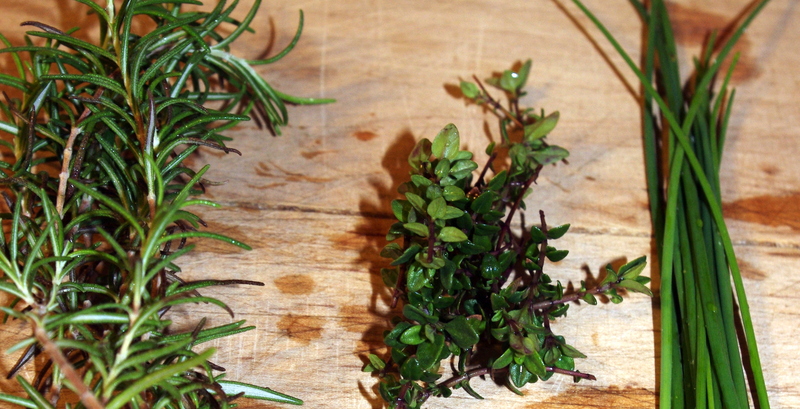 1) Trim the root end of each sprout, and cut in half lengthwise. Rub the flat side of each half with the cut sides of the garlic clove. 2) Heat the oil in a large saute pan over medium heat. When hot, add the sprouts and shake the pan to coat them with oil. Turn the sprouts cut side down and scatter the pancetta in the pan. Cook undisturbed for 6-8 minutes, or until the sprouts are deeply browned (almost black) on the cut sides. 3) Add the vinegar and butter, tossing to coat the sprouts. Season with salt and pepper.